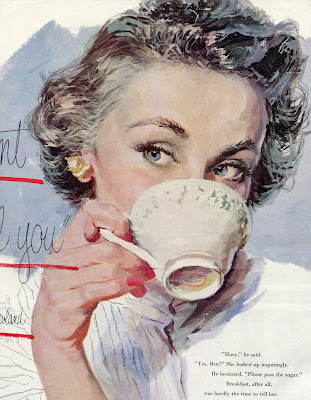 Joe De Mers (1910-1984) illustrated women's magazines in the 1940s and 1950s, a market characterized by simplified pictures of pretty girls against plain backgrounds. Readers demand pretty people in pretty settings forming a pretty picture. The larger your audience, the more limited its taste. It prefers subject matter to design and girls to men. It wants no message other than girls are cute and men like cute girls. 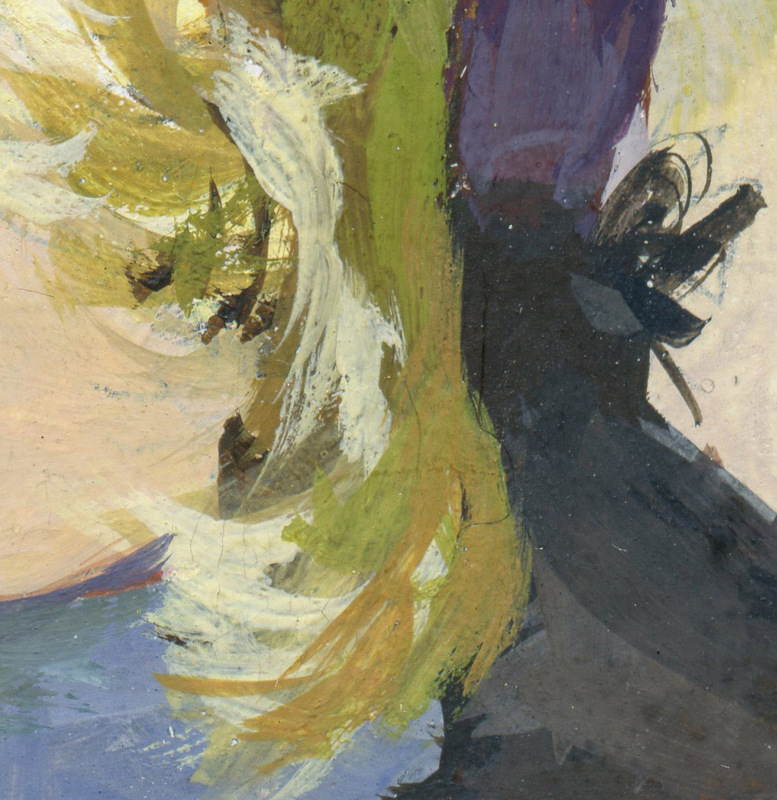 'though I can't imagine at the DeMers' tonsorial parlor stylists strived for modern-conceptual art in individual brushstrokes as you might have us believe. I think Demers' merits stand on their own. It wants no message other than girls are cute and men like cute girls. Well, it is a timeless message at least. Clearly, de Kooning and his cohorts needed larger canvasses. Well put, well put indeed! Avi, Chris Vosters, Scruffy and I Have No Blog-- thanks very much! Neil Toulch-- I agree, those hair stylists were not aspiring to be mini-abstract expressionists, and I especially agree that De Mers' merits stand on their own. I think he was a marvelous illustrator. But I do think De Mers and these "fine" artists shared the common language of abstract design. Anyone who claims that De Mers "sold out" wasn't paying attention. Etc, etc-- Can't argue with you there! Donald Pittenger-- I hadn't considered that. Do you think if we spliced all of De Kooning's paintings together, they would form one huge painting of a newlywed girl with a ponytail, unpacking boxes while wearing one of her husband's oversized shirts? I see your point, but what you don't understand is that De Kooning's abstract is not particularly good looking, in fact it's quite ugly. 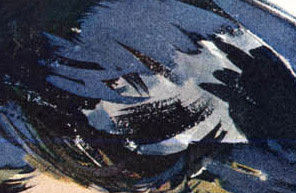 DeMer's "abstracts" - his individual strokes that made up the whole, are pleasant to look at on their own. What modern art is striving for is to reject "beauty" and get to something more important, a language that can only be understood by self appointed elites - and as such it must be ugly, otherwise the unwashed might accidently be attracted to it and that would never do. David, I know it doesn't have that much connection with this particular post, but believe me, you saved my life by being a true art critic: a scientist. Nice! I like that you've stated this argument using the commercial advertising female. (Great close ups!) That's daring.I've always liked the way hair was done by these 50s guys... a great feeling of lively freshness that adds much to the picture. Usually I argue this point using Fechin's backgrounds, because they not only resemble much abstract painterly styles, they also precede them. (There goes the innovation argument) And Fechin's subjects are neutral and can't be said to sell soap directly. By using De Mers, you open yourself up to the "white male hegemonic sexist corporate bourgeoise-pandering pseudo-culture" argument, which would naturally arise if you were really going toe to toe on this topic with a culture vulture in a black turtleneck. Although... maybe now De Mers would be defended as Ironic and rehabilitated on that basis. Best way to start out on a Monday! Ha! Nothing do they know of Jesus' and his apostles' abstract art gallery. That is an absolutely brilliant find! Wonderful! Great post! As a training artist leaning to realism I was amazed when I first realized how much abstract thought and brush strokes are needed to achieve natural looking realism like this. 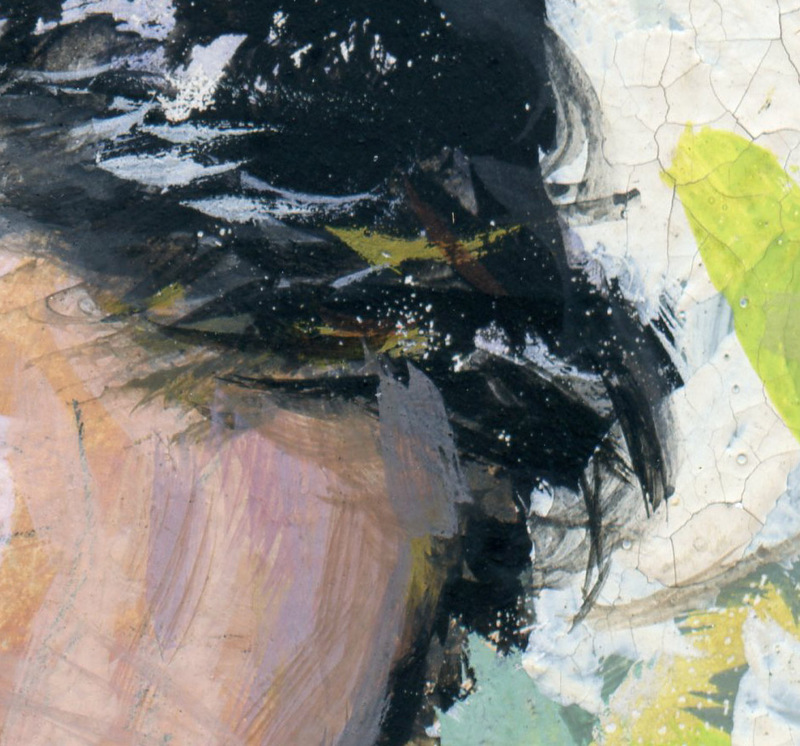 Now I strive to learn the thought processes needed to handle paint like this... it's really fascinating. I've seen portrait galleries full of these 'big head' type of illustrations. Yes, they are pretty girls but DeMers invests them with a quality of life that makes them so much more than pin-ups. Just an image I remembered from Hartt's History of Italian Renaissance Art. Brilliant, I think, is Hegel's theory of the end of art. Scroll about halfway down the page, section 6.2.4, and bear in mind that Hegel died in 1831, well before the birth of modernism (this modern summary includes an evaluation of De Kooning). Why is the word 'pretty' so demeaned ?! At least that is my impression. I'm not particularly keen on "De Kooning/Kline" abstract type stuff. Perhaps I am one of those with...limited taste...! yikes. But it sure is nice to see that you are noting the value of pretty in the 'Mers tonsorial parlor'. Tonsorial--from Latin, tonsorius, fr. tonsor, a shearer, barber, fr. tondere, tonsum, to shear [see tonsure] IE Of or pertaining to a barber or his work! Those "abstracts" on the wall of the last supper are supposed to be decorative porphyry/marbles, right? Including an imperial purple. i don't find painterly marks especially interesting when seen in abstracted close up. 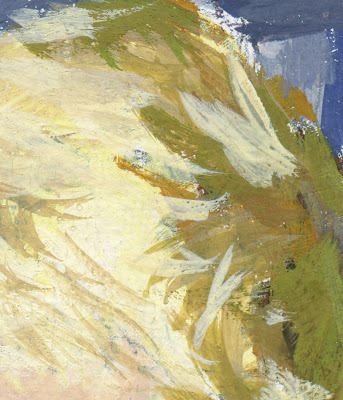 for me, the quality of painterly mark-making comes from how those marks work together to form recognizable things. Yes, marble panels, an artistic embellishment by del Castagno, in, according to the New Testament, a borrowed upper room. For those that seek The Abstract Truth. "the quality of painterly mark-making comes from how those marks work together to form recognizable things." David, I always find your postings so interesting! Thank you for sharing and for taking the time to produce them. kev ferrara, I appreciate your thoughts also! I love all of the 50's illustrators paint strokes (very abstarct)... especially of the woman! Bluetraveler and Frozencove Redux: Thanks! Etc, etc-- that is certainly a terrific example. If the artist hadn't cleverly distracted the viewer, he might have been burned at the stake for such heretical art. Kev Ferrara wrote: "By using De Mers, you open yourself up to the "white male hegemonic sexist corporate bourgeoise-pandering pseudo-culture" argument,"
I think you're especially right about the way those "50s guys" use abstraction to give "a great feeling of lively freshness" to the picture. 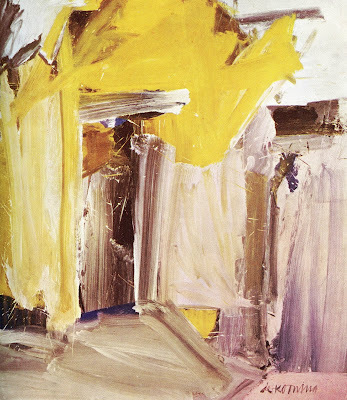 De Mers doesn't just superimpose a De Kooning abstraction on the head of a tightly rendered woman; the hair is more abstract, true, but it remains consistent with the painting of the head, lends it vitality, and most of all performs the role of a map's key or legend, explaining how to make sense of the latent design in the more representational rest of the picture. Antonio Araujo-- you have an excellent memory. I did make this same kind of argument a few years ago with a different set of pictures. 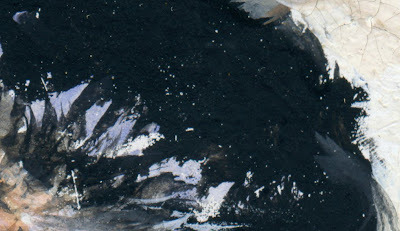 This time I had some De Mers paintings to show off, and that drove everything else. You'd be surprised how many of these topics are just an excuse to share beautiful images with people who appreciate them. I really like Dekooning especially his late paintings. But there is something about scale that brothers me. De Mers paintings are about what, size 18x24 and DeKoning are often over six feet in length and breath. All art is and abstraction, it is how we think and feel about reality, In a lot of ways De Mers paintngs of photos is a big avoidence of reality, as reality arrives per-formed with all of photography's presumptions. Developing a structure out of your lived experience, to show of your brushstrokes is a much harder task it seems to me. Scale-- thanks, I'm glad you have the same reaction I do to this material. Wheee-- welcome from Singapore, and thank you. Alex-- I agree, there are huge differences in the quality of artists who specialize in painting pretty girls. In my opinion, De Mers was one of the best of this genre (along with Coby Whitmore and Joe Bowler). On the other hand, I've never cared for the work of pin up artists such as Vargas. 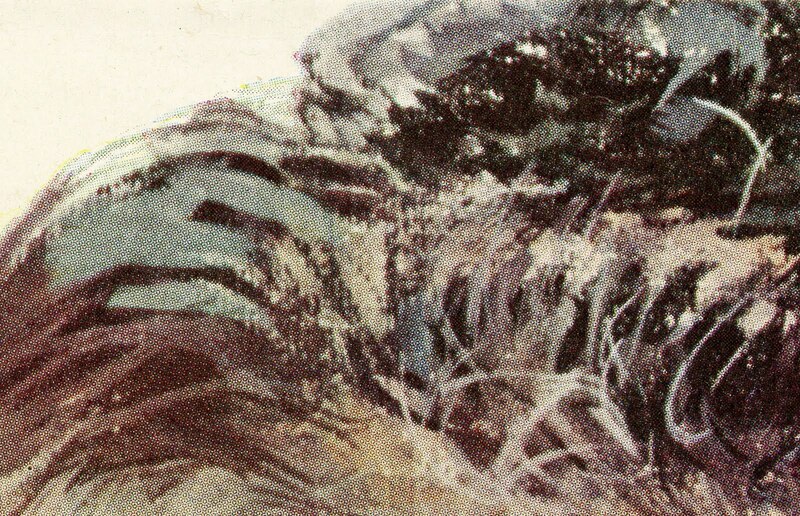 Laurence John wrote, "i don't find painterly marks especially interesting when seen in abstracted close up." I take your point. As I tried to indicate above, one could make any artist appear "abstract" simply by looking at a tiny portion of a painting under the microscope. Such samples may be beautiful but they don't capture much by way of a conscious decision on the part of the artist. For the analogy to be instructive, the sample must be at least large enough to capture conscious acts by the artist making recognizable things as well as acts of abstraction and pure design. Tom-- when I wrote that De Kooning painted those women with a "terrible beauty," that was a sincere compliment. I meant terrible in the sense of causing great fear or awe, not "bad." I like much of his work too. I also agree with you that scale is important and that all art is abstraction. However, I disagree that developing an abstract structure out of your lived experience is harder than using reality pre-formed "from photographs." It is easier to cheat in abstract art (using random marks and gestures until you hit upon something), yet there is a staggering amount of crap generated in that field. "Bourgeois pablum" - love it!! Of course, the fans of abstract expressionism were anything but narrow and leader-following in THEIR taste. lol. Etc, etc-- "the upper room"
I see that अर्जुन has some competition in the category of surrealistic bissociation. Good. It's always an interesting challenge connecting the dots. StimmeDesHerzens-- I think "pretty" art is demeaned because it is viewed (by its critics) as insubstantial and focused on surface considerations rather than deeper, more meaningful truths. But as I tried to suggest, "pretty" is not necessarily incompatible with the types of design challenges faced by DeKooning and Kline. Sometimes artists can do both. 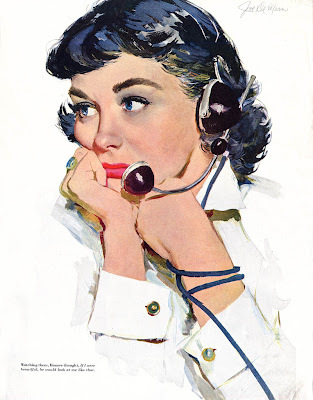 And as for Mr. Al Parker, the brilliant illustrator who I quote as disparaging "pretty," I imagine he got tired of getting assignments calling for just another pretty face, but I'll wager he never got tired of seeing a pretty face next to him on the pillow when he work up. अर्जुन-- Thanks for the abstract truth! Stephan Chobanian-- Thanks for taking the time to read these things and to comment! Off the Coast of Utopia-- Thanks very much! Jaleen-- always happy to hear from the Baader-Meinhof wing of the illustration field. I very much enjoyed reading your excellent and authoritative treatment of Walter Haskell Hinton. Your scholarship set an impossible standard for the rest of us. What if Joe De Mers really let his hair down and channeled Willem De Kooning for the illustrations? 'Yes, Ben?' she looked up inquiringly. Breakfast, after all, was hardly the time to ask her." the text has whole new meaning. Maybe, De Mers was simply channeling Édouard Manet instead of the contemporary artists of his time. Another lovely post David, many thanks! 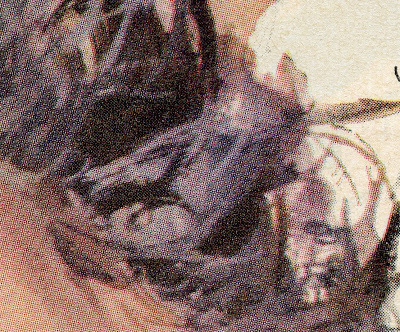 Those close ups of the hair do seem to be the abstract gestural embodiment of the feeling of swooning - the artist's delight in the intoxicating femaninity of these women. It is the context supplied by the painting as a whole that makes us aware of this particular reading and focuses its emotional particularity. 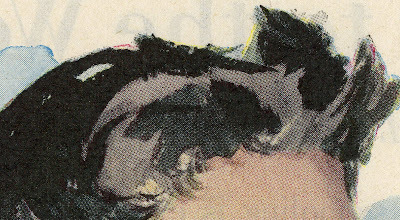 Much as the drawing of the nostrils, lips and ear lobes of the Leonard Starr's women induce a sense of embraceable, kissable oblivion in the white newspaper that sits between them. Very interesting. Illustrators seem to be fine artists who would like to get paid. Wonderful stuff. I can't wait to see what you post next. I remember reading Hegel and thinking the same thing about how well he understood human nature, and therefore could, more or less "predict the future" of art. However I obviously don't share his view that without addressing the "divine" art necessarily goes down the path of nihilism and vapidity. I mean, in 1820 the entire history of Great American Illustration had yet to be written, and most of it is about other things than the divine. Which is another way of saying that concepts of experience are a perfectly fine subject matter. Certainly your point that illustration was an exception is beyond dispute. However, I would argue that, 1. illustration's stronger bond with narrative, and therefore meaning, somewhat immunized or delayed the effects of Hegel's apocalyptic plague, and, 2. improvements in printing technology was a considerable booster shot as well. well very interestating I never think about it :O i'm very surprised, nice job ! It's amazing - "plus ca change..." and all that. At art college back in the eighties, I was made to feel less valuable than my fellow students as I had a natural ability to draw in a very "pretty" style, and although I searched desparately for something deep and meaningful to say, it just wasn't forthcoming. (I was seventeen.) Over the years I lost touch with all my artist friends and so my own style had space to develop on its own. Now I still make pretty pictures. So pretty, in fact, that I can't wait to get my breakfast gulped down so that I can get to work. I adore the world of beauty that I see everywhere - and I still do not have anything more meaningful to say than that - our world is breathtakingly beautiful. Patterns, colours, shapes - there's so much to capture. Pity I can't blog my new kids' book - I have to wait until it's published, but my deadline is Monday for submission so it won't be long. Meanwhile, I post all the other beautiful things I cram in. And I am proud of my difference now - how I wish I could revisit my 17-year-old self and say, "Just wait. Be confident. And DON'T let the turkeys get you down!" Matthew Harwood-- Famed art collector Muriel Newman, a contemporary of De Kooning, claimed that he began doing his famous paintings of women after she angered him by refusing to sleep with him. Noskill1343, crying_lightning and DynamiteJ-- Thanks for writing! Doodlemonger-- " I can't wait to get my breakfast gulped down so that I can get to work. I adore the world of beauty that I see everywhere...."
Sounds like you've worked out the right balance. And congrats on your new book for kids. I don't think it proves too much - anything blown up will look abstract. That's what the beauty of abstract is: a focus on the texture, colours, and shapes divorced from (as much as possible) any framing of representation - a focus on the base dynamics only. Wow, I see your comparisons support a strong arguement.. Personally I love abstract, especially vibrant expressionism. The abstractions here though, by themselves do not appeal much to me, though they do press a point when you explain the article the way you do. David Howard wrote: "anything blown up will look abstract." That's certainly true at the microscopic level; if you take a small enough slice of the most realistic painting it will always appear abstract. You can also take a terrible painting and transform it into a beautiful composition by taking a tiny fragment out of context. I hope my point goes a little further than that. 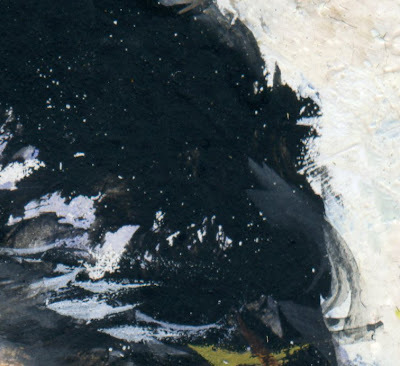 These abstractions are quite visible when you look at the entire picture, as long as you are sensitive to them. More than that, they are prominent and important to the success of the overall picture. The difference is that the "big head" artists displayed a high technical proficiency and made art to make appeal to a wide variety of people within a capitalist economy, I know, evil right, and the abstract artists clearly gaming the bourgeois, presented scribbles as "expressing themselves" and "higher art", too complex for the unintelligent masses, basically stoking the egos of the people they wanted to sell their scribbles to.